An alarm screech goes out through the rainforest. Monkeys of all types throw themselves off high branches and out of trees to freeze in terror. Overhead a giant eagle with a seven foot wing span easily twists and turns through the treetops, hunting for any animal caught out in the open. With a single dive it tears the unlucky creature from its branch with five inch long claws on powerful legs. The harpy eagle is one of the world's largest and most powerful of the fifty species of eagles. It lives in the tropical lowland rainforests of Central and South America, from southern Mexico southward to eastern Bolivia, southern Brazil and the northernmost parts of Argentina. It likes large areas of uninterrupted forest but will also hunt in the open areas next to patches of forest. the harpies of Greek mythology which were ferocious winged creatures with sharp claws, a woman's face and a vulture's body. The average weight of a harpy eagle is 18.4 lbs (8.2 kg). 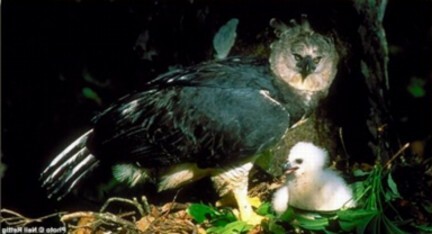 Female harpy eagles are larger than the males. A female can weigh from 14 to 18 lbs (7-9 kg), while the males weigh 10 to 16 lbs (5-8 kg). Their body length is between 36 and 40 inches (1 meter). Their feathers are slate-black above and white to light gray underneath. A black band runs across the chest up to the neck. The tail has long, dark gray feathers with horizontal bars. Their legs are covered with light gray feathers ending in yellow feet as big as a human hand, and 5 inch long talons. Their dark gray, large, rounded, broad wings have a span of 7 feet. These wings are relatively short compared to other eagles. They are designed for speed and maneuverability necessary for flying through a forest. The harpy eagle is monogamous, meaning it mates for life. They nest high in the canopy of emergent trees about 100 to 200 feet (40 meters) above the ground. The nests are built loosely of sticks and fresh leaves in the crutch of the first branches of ceiba or kapok trees. Usually two eggs are laid, but after the first egg hatches, the other one is ignored and fails to hatch. The incubation period lasts for 52 to 56 days. The harpy eagle has the longest breeding period of any raptor. They raise only one chick every two to three years. Both parents care for the chick, feeding it for up to 10 months or more. A young harpy eagle will fledge, or leave the nest at about 4 1/2 to 6 months. It will stay in its parents' territory for at least one year. The estimated life span in the wild, although difficult to asses, is thought to be between 25 and 35 years. Harpy eagles are carnivores and duirnal, or daytime hunters. They hunt about 19 species of medium sized and large mammals that live in trees, like monkeys, sloths, opossums, large reptiles like iguanas, large rodents and other birds. They hunt by sitting quietly and listening for prey for long periods of time in the canopy of the forest, then pouncing on their prey in short bursts of speed. They can reach speeds of up to 50 mph (80 kph). The faster and more agile males hunt smaller animals than the larger females. Like other birds of prey, they can only fly with prey weighing less than one half their body weight. 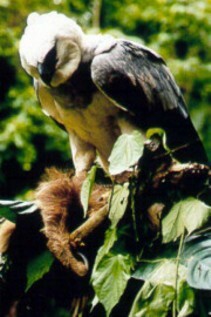 The harpy eagle is an endangered species. The major threat is loss of habitat from clear cutting, destruction of nesting sites and shooting. Harpy eagles need large tracts of forest to hunt in. Most forests have only one nest every 10 or 15 miles. Each nesting pair has a single chick every two to three years. With such a low density of harpy eagles and their low rate of reproduction, even the smallest pressure on their hunting abilities eliminates them from an area. "BirdLife International 2004. Harpia harpyja. In: IUCN 2004. 2004 IUCN Red List of Threatened Species." <www.redlist.org>. Downloaded on 18 April 2005. "The Hawk Conservancy Trust - Harpy"